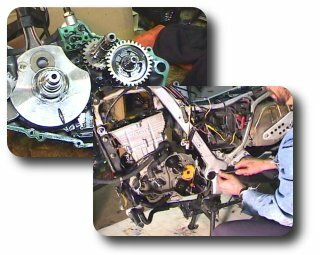 These DVDs and videos show you how to perform BMW F650 maintenance yourself. They serve as a companion to a good service manual and solid wrenching skills. The maintenance performed in the DVDs is conducted on various different models of the F650 include the Classic and the GS. While there are some differences between the bikes, with a little help from the FAQs you should have no problems working on your bike. The videos cover a variety of topics such including toolkits, and picking up your F650. Note: Some information in the DVDs and videos may be out-of-date. Please check the FAQs for more detailed information and possible updates. Also check the FAQs for tools and torque values relevant for your bike. and a flat screwdriver instead of 12mm allen. The DVDs are esentially free (but copyrighted) - if you paid for them you got ripped off (although you may have paid for the cost of blank DVDs and postage). You are encouraged to share the DVDs with F650 friends - so long as you do not charge for it. If you find someone who is charging for the DVDs, or is taking credit for them, please let us know. And finally, join the Chain Gang - The club, websites and these DVDs only exist through your membership support. Note: Nobody makes a profit from the Chain Gang DVDs. The website and DVDs were created by volunteers. The website is updated by volunteers and the DVDs are distributed by volunteers. The DVDs are distributed electronically at no charge. The DVDs are in North American NTSC format, but most PAL DVD players can play both formats. Each DVD image is 4GB in size. The .iso DVD images are not immediately playable or viewable on your computer. You must burn discs from the images first. There are many available software products that can burn discs from .iso images. These files were downloaded from Nate Le Pain's YouTube Channel and converted to M4V format for compatibility with Apple iTunes, iPad, iPod, iPhone and most other smartphones. You can easily carry them with you wherever you go. The FAQs are not available for purchase on CD-ROM at this time. We'll update here if and when this changes. Way Cool. OK OK. Ill send in my $$$ for membership.